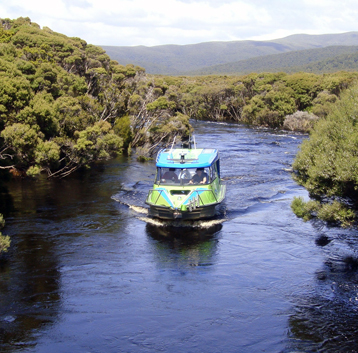 The Freshwater River Cruise is a thrilling adventure across Paterson Inlet and long the winding Freshwater River to Freshwater Landing. The cruise is 2 hours and we spend approx. 10 - 15 minutes at the Landing to view the area, take photos, and walk along the swingbridge (optional) to check out Freshwater Hut, before travelling, down the river. Time permitting, we may explore part of the northern shore of Paterson Inlet, including Kaipipi Bay and Faith, Hope and Charity Islands. 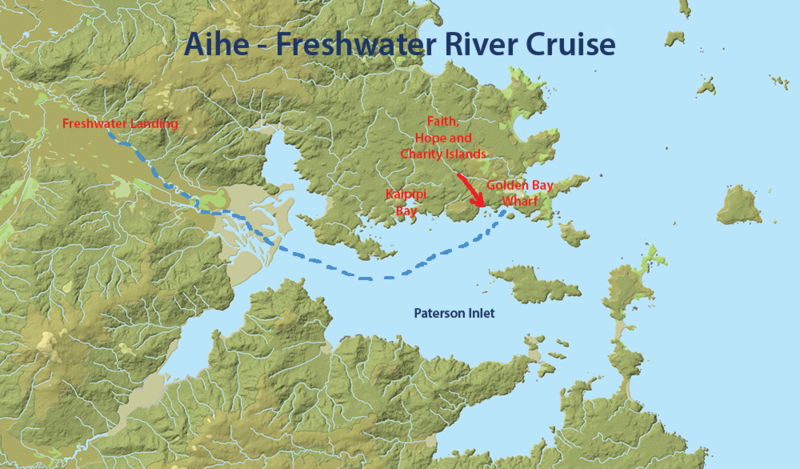 The Freshwater River cruise travels from Golden Bay Wharf, upto the head of Paterson Inlet and along Freshwater River to Freshwater Landing and back. 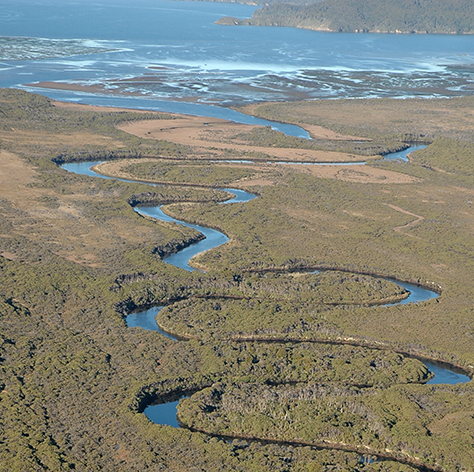 Cruise Take an thrilling cruise along the winding, primeval Freshwater River, to Freshwater Landing. Enjoy the scenery and any wildlife present. Take a short break at Freshwater Landing to view the area and to take photos before returning. Time permitting, visit picturesque Kaipipi Bay and Faith, Hope and Charity islands. Little blue penguins, occasionally yellow-eyed penguins, white-fronted terns, oystercatchers, Stewart Island shag, spotted shag, pied shag, little black shag, swans, kingfisher. Bottle-nosed dolphins occasionally. Maximum 9 persons - limited by Dept. of Conservation permits issued to commercial vessel. Children Suitable for children from 10 years. Younger children are allowed at the discretion of management. 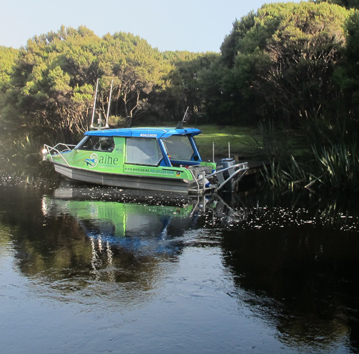 Available All year round, subject to demand and access to Freshwater River. Times Varies - based on high tide and daylight hours. Fitness Ability to get on and off boat. Optional short walk 5 - 10 minutes at Freshwater Landing. This cruise is only available at high tides for access to Freshwater River (as mudflats cover the entrance at low tide) and during daylight hours. Times vary each day. For information on other cruises, see Cruise Options. © Copyright 2016 Aihe Eco Charters & Water Taxi.